In posthumous message, Stephen Hawking warns of "reckless indifference to our future"
Stephen Hawking warned in his final book that the greatest threat facing the world was climate change, according to Vox. The scientist, who died in March at 76, wrote that humanity was behaving with "reckless indifference to our future on planet Earth," the online news outlet reported Tuesday. In his book "Brief Answers To The Big Questions," Hawking wrote that it was "almost inevitable that either a nuclear confrontation or environmental catastrophe will cripple the Earth at some point in the next 1,000 years." Should humanity find a way to avoid the consequences of such an event, the demise of Earth's species "will be on our conscience as a race," Hawking wrote. On Monday, Hawking spoke from beyond the grave to warn the world that science and education are under threat around the world. His words were broadcast at a London launch event for his book. Hawking warned that education and science are "in danger now more than ever before." He cited President Trump's election and Britain's 2016 vote to leave the European Union as part of "a global revolt against experts and that includes scientists." Acknowledging that science had yet to overcome major challenges for the world — including climate change, overpopulation, species extinction, deforestation and the degradation of the oceans — the physicist still urged young people "to look up at the stars and not down at your feet." "Try to make sense of what you see, and wonder about what makes the universe exist," he said. "It matters that you don't give up," he said. "Unleash your imagination. Shape the future." 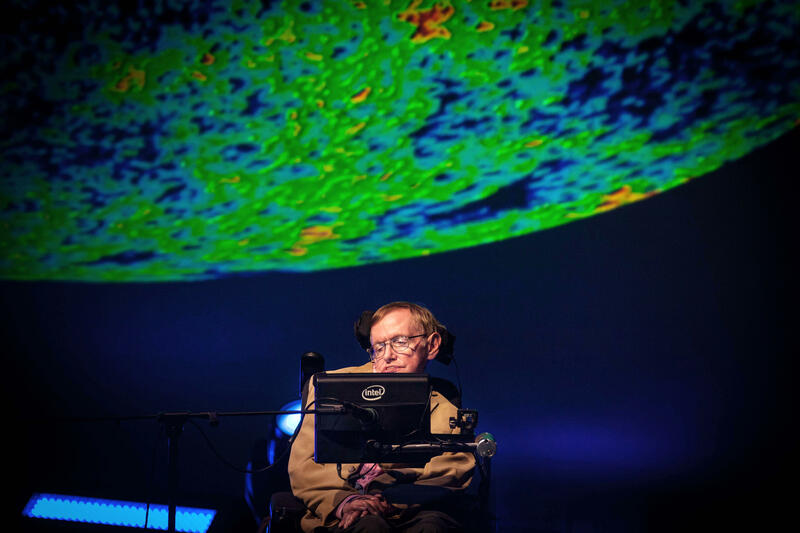 Hawking lived for more than five decades with motor neuron disease that left him paralyzed, communicating through a voice-generating computer. In June, his ashes were buried in Westminster Abbey, between the graves of Charles Darwin and Isaac Newton. Hawking's daughter Lucy, who attended the book launch, said hearing her father's unmistakable voice had been "very emotional." "I turned away, because I had tears forming in my eyes," she said. "I feel sometimes like he's still here because we talk about him and we hear his voice and we see images of him," she said, "and then we have the reminder that he's left us."